Do a rough check of the terrain and any obstacles that lie in the path. 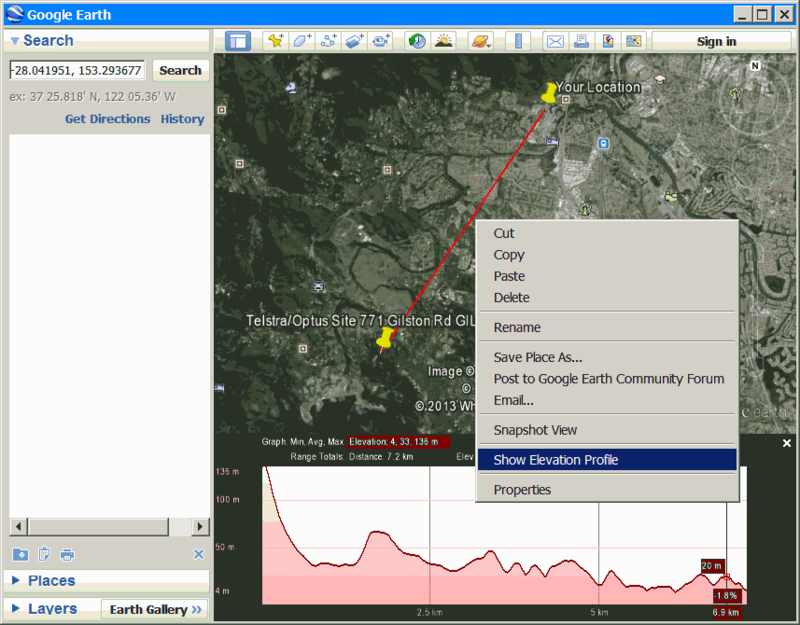 4.1 Locate tower in Google Earth. B. Click the [KLM] link. 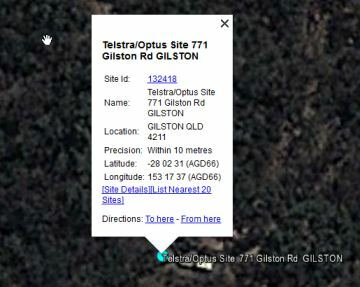 C. Select "Open with" and press OK.
D. A new Google Earth Placemarker is dropped at the location of the tower. Click the to view site summary & links to site details. Street View - ACTUAL tower location. 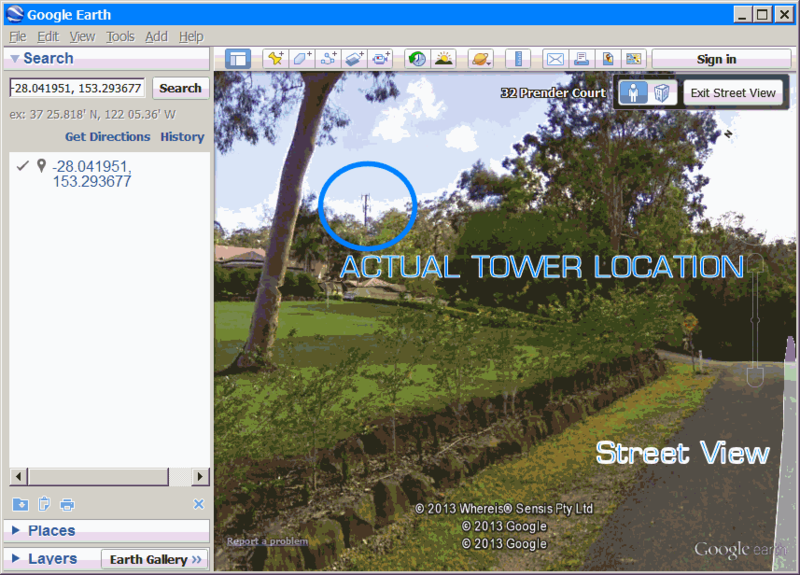 If the location of the tower is not obvious from the first Sky View, you may need to use Street view to visually locate the tower. 1. With the mouse, click-n-drag the Street View icon to a position where it appears you'll get a good view of the tower. 2. Scanning around look for the tower. It may help to draw a line to where you expect the tower to be. 3. Drop a Placemarker Pin at the exact Tower location and name it. 4.2 Draw the Path from your location to the tower. A. Zoom out so that you can see both your placemarker and the tower marker. 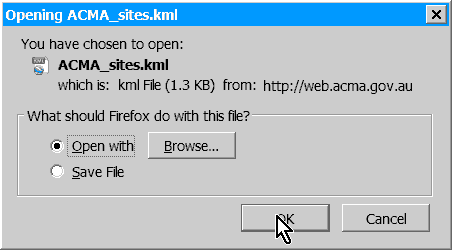 B. Click the ADD PATH icon select the [Style, Color] tab. - Set the Color to RED or BLUE, something that stands out. C. Zoom out so that you can see both your placemarker and the tower marker. A. Right-mouse-click on the Line you've just drawn and select Show Elevation Path. TIP. 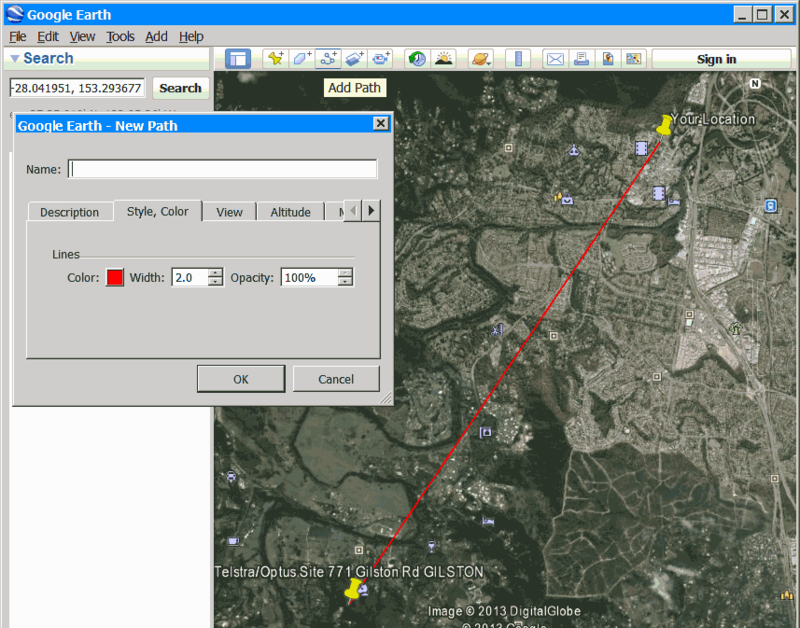 The profile becomes more accurate as you zoom in on parts of the path line. Double click on sections of the elevation profile to zoom in and load that section of the contour. A. 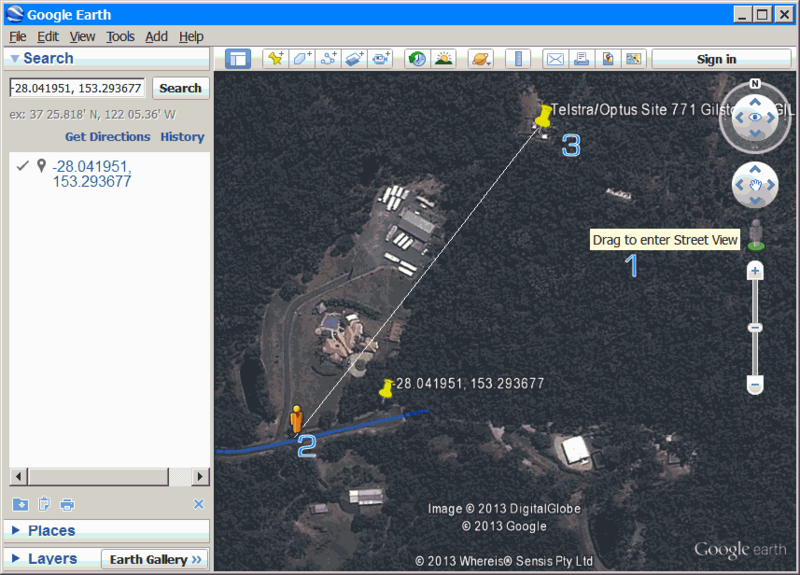 Note the position highlighted red above, at the position of the first hill (obstacle) closest to your location. This hill is about 14m higher than your location and may obstruct the Line-of-Sight (LOS) to the tower. B. The distance is only 7.2km which is quite a short distance and will give stronger signal to counter act the effect of obstacles in the path. This also means that the effect of the earths curvature will be negligible. Distances of 26km must take into account the curvature of the earth. Google Earth does not account of this curvature, so we need to use a more sophisticated calculator . C. This example Cell Tower is quite elevated in altitude. This will also help with getting signal over obstacles.